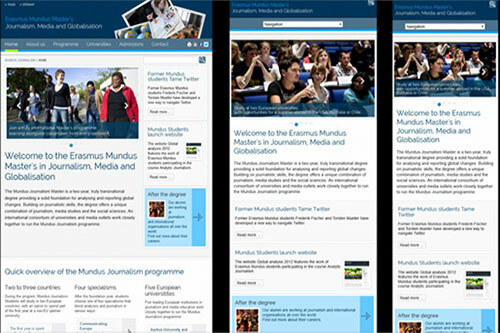 City's Erasmus Mundus Journalism programme launches new website with responsive design. City University London's prestigious Erasmus Mundus Journalism programme has moved to the forefront of online marketing and communication with its new tablet- and mobile-friendly website. The MundusJournalism.com site has been rebuilt from the ground up using the principles of so-called 'responsive web design' a design approach aimed at creating websites that deliver the best-possible viewing experience across a wide variety of internet devices: from mobile phones to desktop computers. The Erasmus Mundus Journalism programme is an EU-funded 2-year Master's degree offered jointly by City University London, the University of Aarhus, Denmark and six other partner universities including the University of California, Berkeley. The programme offers scholarships worth between €23,000 and €48,000 to selected students. City's Erasmus Mundus Journalism Programme Director, Dr Neil Thurman, led the project. He said: "Like most websites, the Mundus Journalism website now gets a significant proportion of its visitors from mobile devices. Before we launched this new website we weren't giving those visitors the optimum reading experience. Now we are, and we're seeing the benefits. Since launching the new responsive website, mobile visitors are spending 37% more time on the site." 2013 has been called the "Year of Responsive Web Design", and an increasing number of organisations are rebuilding their online presence along responsive design principles including Time Magazine, The Boston Globe, The Guardian, Vogue Magazine, Temple University, University of California San Diego, Westminster Abbey, and Lancaster University.